When you need an easy, tasty, weeknight-doable, family-friendly meal, nothing beats the convenience of sautéed chicken breasts. 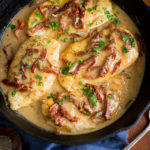 And when you happen to have sautéed chicken AND sun-dried tomatoes in a creamy Madeira sauce, you’ve got something special. Special doesn’t have to mean decadent though. In this case, the creamy sauce is made without any cream. Thanks to the nifty trick of whisking flour to the pan drippings to make a roux, you’ve got the base for making an amazing pan sauce. Then all you have to do is whisk in some Madeira wine (which adds brightness and just a touch of citrus flavor), chicken broth, and milk for richness with less fat. So simple. So good. The recipe makes a generous amount of sauce – perfect for serving with some crusty bread or hot pasta … or just eating with a spoon. Slice each chicken breast horizontally to form 4 flat, thin pieces. Sprinkle both sides of each chicken piece generously with salt and pepper. Dredge the chicken in the flour, shaking off excess. In a large heavy skillet, heat 1 tablespoon each of olive oil and butter over medium-high heat. Add chicken and cook until chicken is nicely browned on both sides, about 2 minutes per side. Transfer chicken to a plate. Reduce heat and add remaining 1 tablespoon each of olive oil and butter to the pan. Add shallots and garlic and cook, stirring occasionally, until shallots are golden brown in spots, 2 to 3 minutes. Stir flour into the shallots mixture and continue cooking 1 minute more. Add the Madeira wine, whisking constantly, until the wine is incorporated into the flour. Whisk in the chicken broth and then the milk. The sauce will separate when the milk is added – just continue whisking and the sauce will come back together. Bring the mixture to a low simmer. Carefully add the chicken back into the sauce along with any juices from the plate. Add the sun-dried tomatoes. Simmer the sauce over medium low heat until the chicken is cooked through and the sauce has thickened slightly, about 5-10 minutes depending on the size of your chicken. Season to taste with salt and pepper. Sprinkle chicken with parsley and serve with hot cooked pasta or crusty bread.